Study abroad loans are available to US students going abroad, whether they are going for just a semester or for a year. Learn more about how you can get the money you need to study overseas. Thank you for attending our hangout today, I’m Bryanna Davis with International Student Loan. Although more often than not we have information for non-US students coming to the US, today we are going to talk directly to US citizens who are studying abroad. If you’ve decided that you want to spend the semester, year or entire degree-seeking years abroad and you’re worried you won’t be eligible for educational loans simply because you’re studying abroad- we’re here to let you know that that’s not the case. US citizens and eligible non-us citizens who are enrolled in an eligible school and study abroad program, often have access to loans, both federal and private- so today we are going to discuss your options. You essentially have two options- federal and private loans. Federal loans are granted through the government, while private loans are granted through a private institution such as a bank. Although International Student Loan specializes in private loans, we want to also touch on federal loans because they can be a great way to fund your education- and where you should turn before you look at private loans. Before we start- as always, please feel free to send in your questions on study abroad loans and we will get those answered in the end- you can also send in any questions that you have on Twitter using #FinancialAidTalk. We are going to start by looking at Federal loans- so first, if you haven’t already, we recommend that you fill out a FAFSA, the Free Application for Federal Student Aid, to see what aid you are eligible to obtain. Completing the FAFSA application will let you know if you’re eligible for federal loans, but also grants or work-study funds. Now the only portion that we are going to discuss today, is the loans portion- just keep in mind that when you complete the FAFSA it will let you know a wide variety of aid you are eligible to obtain. whether you are earning credits at a US or international school, you will complete the FAFSA in both instances. There are a few deadlines to complete the FAFSA, the federal deadline is June 30th- the state deadline which will vary from state to state, and then your school might have a deadline also. So you will need to make sure you know and meet all three deadlines! US citizens and eligible non-us citizens can complete the FAFSA. If you’re not sure if you qualify as an eligible non-US citizens, go to the FAFSA website to double check your situation. There are multiple individuals who are eligible as non-us citizens, so check it out. There are a few different types of federal loans, your personal situation will determine which you are eligible to receive. We’re going to take a quick moment to explain the differences. Direct Subsidized Loan: available to eligible undergraduate students who demonstrate financial need. Direct Unsubsidized Loan: Open to undergrads along with graduate students and professional students. You do not need to show financial need. Direct PLUS Loans: If your parents want to help you pay for your education and need a loan- the PLUS loan is a good option. There is not a minimum amount that can be borrowed, the maximum will be total cost of attendance for the year, minus any other aid received. Federal Perkins Loan Program: Available to undergrad and graduate students who show an exceptional financial need. What’s the benefit of federal loans? So, after you’ve explored your options of federal aid- you might not have as much aid available to you as need, you missed the FAFSA deadline, or maybe you decided not to complete the FAFSA in general. In any of these situations, you still have the option to explore private loans. Private loans are just as they sound- a loan that is through a private lender, like a bank. Private loans are great if you’re trying to fill the gap in the last bit of aid that you need - you can borrow up to the total cost of your education, minus any other aid you’ll receive. So when do you need to apply- is there a deadline like with the FAFSA? There is not a deadline to apply for a study abroad loan, you are able to apply at any time. However, to ensure that you have the aid ready to use when you need it-know that the initial approval takes between 2 and 6 weeks. Disbursement dates will be set by your school, but it will meet the federal regulations of being no earlier than 30 days from the loan period. Students who are US citizens or US permanent residents studying abroad through an approved US school, or directly enrolled in an eligible international school. 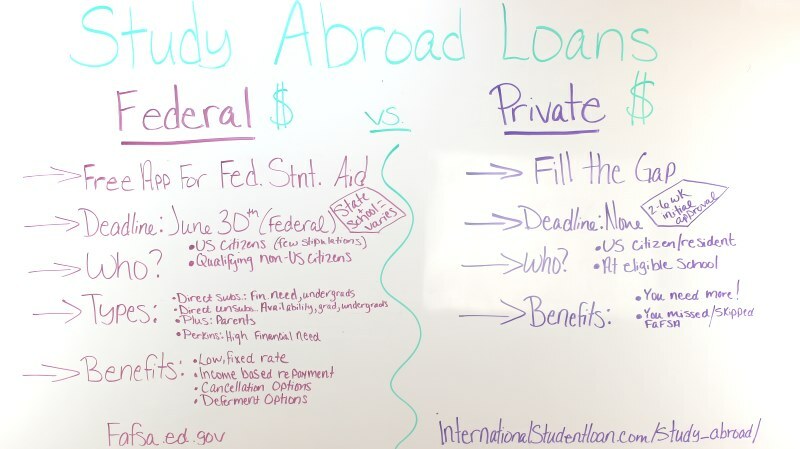 As mentioned previously, if you weren’t able to get as much federal aid as you need- or if you missed the FAFSA deadline altogether, a private study abroad loan is a good way to help fund your education. If you need a study abroad loan, visit this link: http://www.internationalstudentloan.com/study_abroad/ There you can use the loan finder tool to see what lenders are available to provide you with a study abroad loan at your school. You can also find more information on study abroad loans. We’ve had a few questions come in- so we are going to take a look at those. If you have any new questions that arise- please send them in.